If you were to attend a typical practice for the Silicon Valley Roller Girls, at first glance the crossover between our love of derby and our love for a plethora of other fandoms may not be immediately apparent. But upon closer inspection, you start to notice the geek shirts and tattoos, maybe peek into the book drive collection box to be greeted by the site of an overwhelming number of fantasy and sci-fi novels, or maybe you overhear some locker room conversation about how everyone needs to wear their Star Wars shirts for our practice on May 4th and it becomes apparent that we both collectively and individually have a lot more passions in our life beyond roller derby. From Star Wars to Monty Python, to Harry Potter to Dungeons and Dragons, Dr. Who, zombies, Hayao Miyazaki, Pokemon, Game of Thrones, Flash, Batman… the list goes on. Throughout the weekend, fans can find us on the Mezzanine with the rest of the fan tables. So stop by! Representatives of the league will be there to mingle and answer questions, help figure out how you can join the league, purchase steeply discounted tickets for our home bout on June 6th in downtown San Jose, and more. 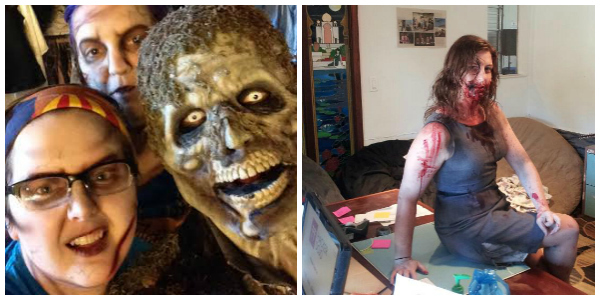 (left) Georgia O’Grief in her zombie makeup and (right) Nora Drenalynn in hers. It is our sincere hope that, since so many of us love so many fandoms that the members of BayCon love, that this weekend you will discover a new, very inclusive fandom which you can take part in-- roller derby. So stop on by, and talk derby to us! i love SVRG, oh so very much! 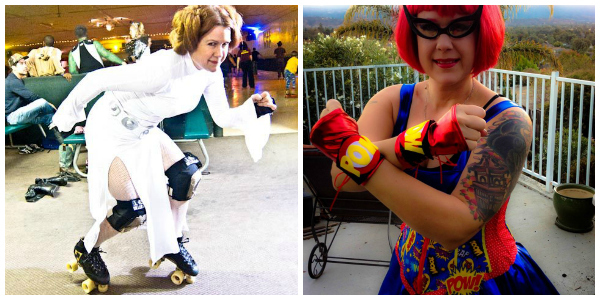 So fun that ALL THE SVRG PASSIONS (derby, cosplay, general nerdiness) will come together at BayCon! 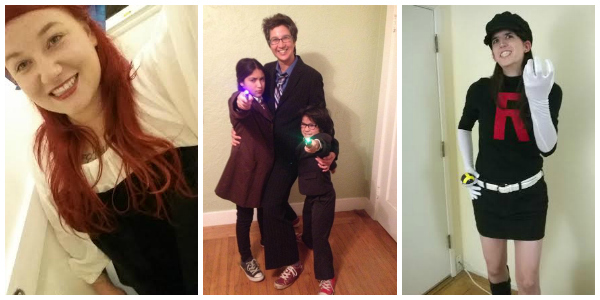 Mockingjam and I cannot wait to mix, mingle and get our Dr. Who cosplay on at the con. THIS WAS SO MUCH FUN. Thank you everyone, from my fellow SVRG'ers to BayCon, for this super fun opportunity. Getting to do a panel for the first time was a big highlight to my otherwise insane weekend. And if anyone is reading this who was at BayCon and didn't attend, you totally missed out. Just saying.